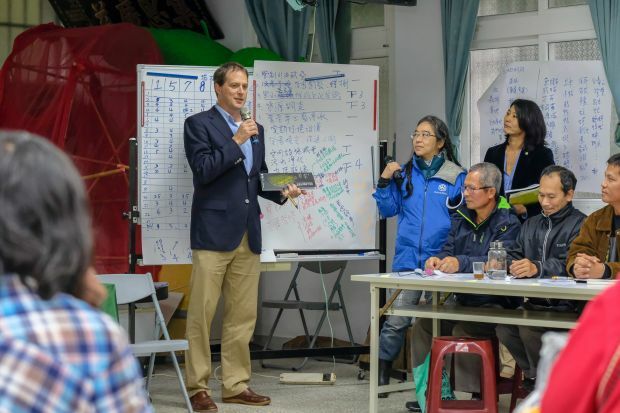 On 16 and 17 January, UNU-IAS shared its expertise in an International Workshop on Resilience Assessment of SEPLS held in Chinese Taipei, organized by the Society for Wildlife and Nature (SWAN International). The event focused on the “Indicators of Resilience in Socio-ecological Production Landscapes and Seascapes (SEPLS)”, which were developed in part by UNU-IAS authors; and UNU-IAS International Satoyama Initiative Communications Coordinator William Dunbar was invited as one of the two experts to lead the workshop, along with Dr. Ikuko Matsumoto of the Institute for Global Environmental Strategies (IGES). The first day of the workshop consisted of a conference hall session attended by around 100 participants, in which the experts gave an in-depth introduction to the “Indicators of Resilience” project and resources available, with the goal that participants would be able to conduct field-based resilience assessments in the future. On 17 January, selected participants traveled to the Gongrong community in the north of the island, where a resilience assessment workshop was carried out with 22 members of the local community and around 20 observers. The “Indicators of Resilience in Socio-ecological Production Landscapes and Seascapes (SEPLS)” are a tool for community-based resilience assessment, produced through a collaborative activity under the International Partnership for the Satoyama Initiative (IPSI), which has a secretariat hosted by the UNU-IAS International Satoyama Initiative (ISI) project. The resilience assessment used the “Toolkit” publication produced under the project, and community members expressed the hope that they will be able to improve the resilience of their landscape through better understanding and future resilience-strengthening activities.